I love the look and texture of natural beads, especially those that come from above ground, like wood, coconut and tagua. One of the best things about vegetable beads is that they are so lightweight; you can really pile them on without creating a piece that is too heavy to wear. 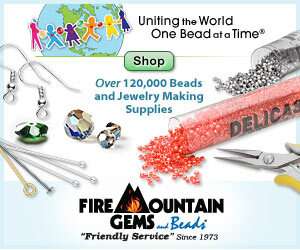 Beads made from wood and seeds are excellent for spring and summer jewelry. Today I thought it would be fun to create some outfits entirely around wooden accessories. Even when paired up with bright colors, the natural qualities of the wooden components allow them to blend well with so many different styles, so you can do a lot more with them. I started with a beautiful multi-strand necklace with hints of turquoise and yellow. This piece has lots of big, bold, round wooden beads, and looks incredibly versatile. It’s a necklace you could wear to the market, or out for drinks. First I paired this necklace with a cute and simple sundress with a cinched waist and pretty leaf pattern. The neutral palette makes it almost plain, but it’s a perfect backdrop for the necklace, and whatever accessories one can layer on. I added a pale blue scarf that could be worn a million ways to add a dash of color to the top half of the outfit. For the bottom, dark yellow platforms by Michael Kors inject a little more personality. When it comes to color, shoes have no boundaries - they can always make a palette come together. I topped everything off with a wood and leather Midori handbag, and simple wooden disc earrings to match the dress. I couldn’t resist the Catherine Malandrino patterned tunic for a casual outfit. I love the saturated colors, and since they move away from the low-cut neckline, this top is perfect for a statement necklace. I paired it with some everyday denim capris and adorable toe-ring sandals with turquoise accents. A leather duffle bag adds an extra layer to the neutral side of the palette, and has just enough room for a little picnic lunch in the park. For earrings, I chose plain wood discs with tiny filigree accents that won’t compete with the other, bolder pieces. For both outfits, I selected a fun memory bracelet that almost matches our wood necklace. It’s a little heavier on the turquoise, and makes a great complement for each style. The handmade and vintage alternatives for this collage are some of my favorites so far. 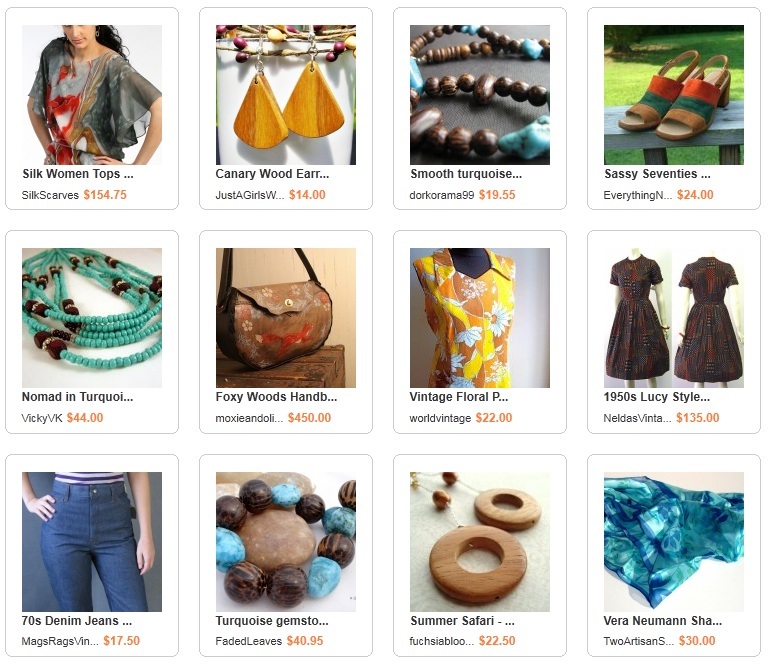 This collection of woodsy spring pieces turned out fabulous. Do you like to use wood or vegetable beads in your designs? What materials do you like to pair them with? Love all the looks! Thanks for sharing. Cheers! Thanks, Whitney! Fair warning: Polyvore is incredibly fun and there are about a million ways to use it. You might get hopelessly hooked! Love that Lucy dress!!! I think the natural beads with the turquoise is gorgeous, maybe add a little orangy-coral? Love the turquoise and brown color combination! I don't use a lot of wooden beads in my work at this point. I got a few large brown ones through the Art Beads program a while back. I should pull them out sometime. I love it! I really like looking around Polyvore and admiring the editorial style collages that people make - you totally nailed it! The color palette is awesome, and it's great to see the Ancient Roman beads in there!